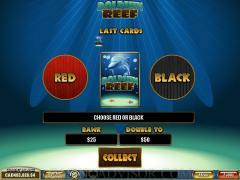 Dolphin Reef is a 5 Reel, 20 Pay-line video slot machine game that has been developed by Playtech. This game is part of their new generation video slot games that are available at many of their newer casinos. Some of the older casinos that have switched to the new generation Playtech software also offer this game. The game is meant for the low and mid rollers who are willing to spend anywhere between $0.01 and $1000 per spin. Dolphin's reef, like all other Playtech games, has a very sound animation base which is coupled with some amazing graphics and a simple, yet appropriate, soundtrack. The game is a lot of fun to play, and is bound to keep slots enthusiasts occupied for hours on end. The sounds are soothing, and wonderfully orchestrated and continue to play in the background throughout the course of the game. With a fairly high jackpot and a number of exciting winning combinations, as well as a scatter and a wild symbol, this game combines a variety of features in a relatively simple slot game. 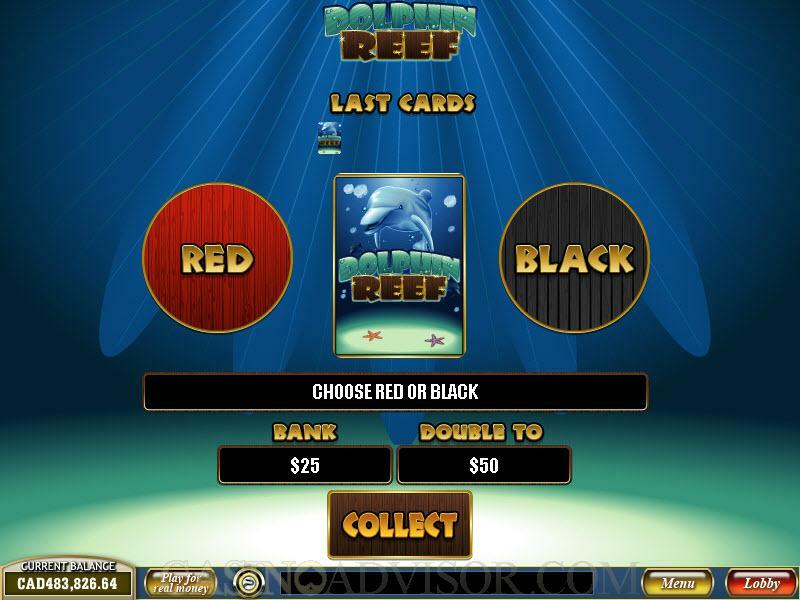 While players can choose to play Dolphin Reef for free at most online casinos, anyone who wishes to make some money by playing slot games will have to opt for the real money version. In this version, players have a choice of coin denominations that range from a very low $0.01 to a mid-sized $5 per coin. The player can choose to change the denomination of the coin played after every spin. The game allows the player to place a bet of up to 10 coins per active pay-line, which makes the maximum possible bet a $1000, which means that the game of Dolphin Reef is suited to players who are looking to wager any amount between $0.01 and $1000. There are eleven regular symbols in this game, which greatly improves the players’ chances of winning a prize. The regular symbols are the anemone fish, dolphin, starfish, seahorse, tortoise, Ace, King, Queen, Jack, Ten and Nine. All the symbols have a very underwater feel to them, including the card faces which are beautifully crafted. Unlike in many games that are featured by Playtech, the wild symbol does not produce the jackpot. 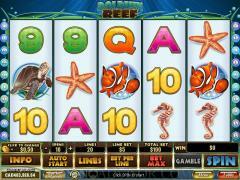 Instead, when a player has five anemone fish symbols on the reels, the jackpot of 500 coins is rewarded. The Dolphin symbol is the wild or substitute symbol in this game. However, this symbol does not act as a multiplier. Also, whenever the symbol appears on any of the activated pay-lines, it does not substitute for other symbols to form a winning combination, but instead it serves as a trigger for the free spins feature. This is a peculiar aspect of this game that is not commonly seen in any other game by Playtech. The wild symbol however, substitutes only for the scatter symbol, which adds great value to the game. Dolphin Reef also has a free spin feature which is triggered by the wild dolphin symbol. 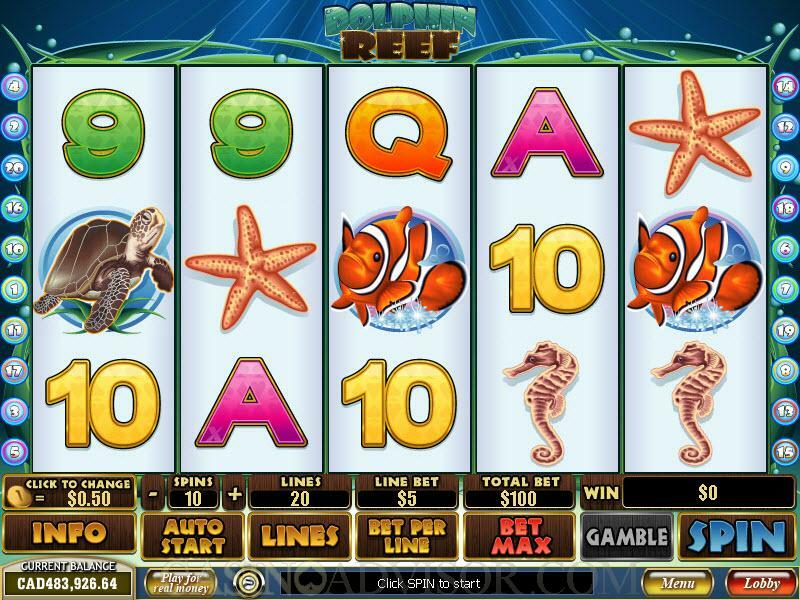 The player wins 5 free spins when the dolphin appears on either reel #2 or reel #4. When this happens, the free spin round starts with the reel#2 and #4 kept as wild, which means that the player has a great chance of winning big in this feature. Interested in reading more detailed information about Dolphin Reef? If so Click Here for more details.